Study time: Approximately 50 hours. Certification: RYA Day Skipper Theory. Day Skipper Theory Assessment: Included and online. The RYA Day Skipper course notes. RYA Day Skipper certificate on completion. Price includes all you need except a pencil. When filling in answers to RYA questions using the innovative form system, the auto-help feature will give you instant help if your answers are incorrect. This is followed by help from instructors who will be available from 07h00 until 20h00 hours seven days a week. Recently added ‘Hint’ buttons make it easy to remember the steps required to answer questions and obtain a successful conclusion. You can study when ever you feel like it and when you have the time. Your enrolment last for three years. Six months access with the option to extend. 15 years experience in RYA online learning. Seamanship: includes parts of the boat, types of warp, knots, chain, anchoring, tying up, preparation for sea and port or starboard tack. Introduction to chart work: chart Familiarisation, points of the compass, latitude and longitude, position of an object, using a Portland type plotter, finding position on a chart. Tidal heights and streams: what causes tides, terminology, tidal height calculations, using tide tables, using the tidal curve, introduction to secondary ports, tidal streams using tidal diamonds and the tidal stream atlas. Position fixing: compass variation, compass deviation, position fixing using various methods, dead reckoning and estimated position. Course to steer: How to plot a course to steer taking into account tidal flow and leeway, how to maintain an accurate ground track. GPS: Abbreviations and terminology, how to use a GPS, raster and vector charts and updating charts. Buoyage and pilotage: Available information, identification of buoys and their lights and shapes, using forward and back bearings, using tidal graphs. Safety: Safety briefs, mayday and rescue, life jackets, abandon ship, actions in fog and radar reflectors. Meteorology: Weather forecasts, weather systems, global effects, local effects, highs and lows and sources of weather information. Passage planning: Puts everything together to form a plan for a safe passage taking into account pilotage for entering and leaving marinas and tides, conditions and wind direction for the main passage. Collision regulations:- General regulations, lights, shapes, sound signals, collision avoidance, stand on and give way. Passage making: Making a longer passage taking into account tidal heights, streams, port entry and exit, weather, ports of refuge, waypoints, crew management and supplies. 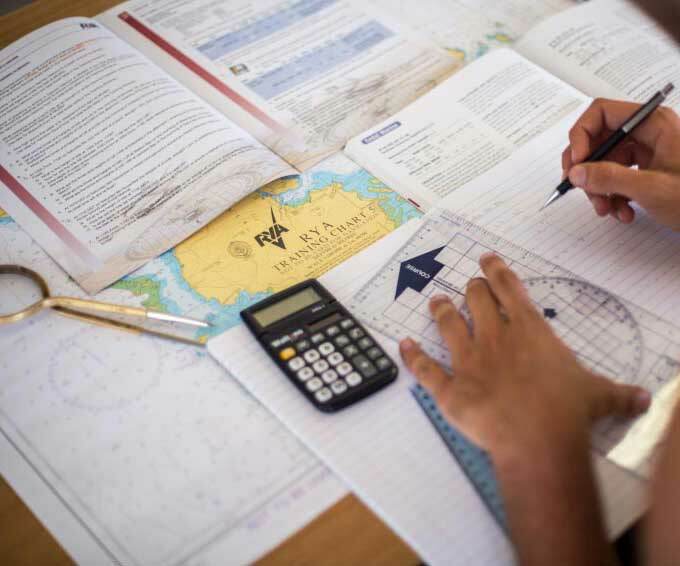 Courses are professionally written by fully qualified RYA instructors with a background in e-learning and computer programming.